‘Nge Tsawai Lama’ won the best film award at the 17th Bhutan National Film Awards 2018. The Film Association of Bhutan organised the event in the capital yesterday to celebrate the 38th birthday of His Majesty The King. Directed by filmmaker Wangchuk Talop, ‘Nge Tsawai Lama’ is about the bond between a teacher and a student; the trials and tribulations of such a relationship. The film also bagged 5 other awards including the best director and best lead actor, male. As part of the award, categorised as the Prime Minister’s Award, the movie received a cash prize of Nu 1m as well. Hingtam Bangzoe and Dari Naba came in second and third respectively in the Prime Minister’s Award. They also received Nu 1m each as cash prizes. Tashi Penjor Dorji was declared the best lead actor male while in female category, Deki Lhamo took the title. Both of them had won the best debut actor awards in the last edition. “This award is an encouragement for me, an inspiration for myself. I would like to request the youth not just to stay back, rather come forward and show their talents as the film industry offers a huge platform,” said Deki Lhamo. In three categories of Best Culture-based Film, Best Film Promoting Dzongkha and Best Youth Film, ‘Dhaari Nhaaba’ walked away with the awards. 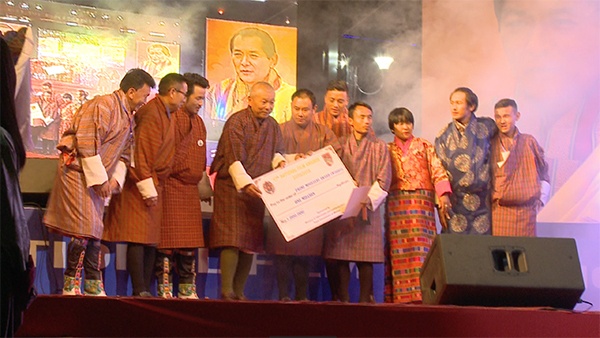 Cash prizes sponsored by the Culture Department, Dzongkha Development Commission and Royal Office for Media were also given away in these categories. “This is the result of my hard work. The movie is yet to be released in the theatres. It is about youth and family,” said Kezang P Jigme, the Producer and Director of Dhaari Nhaaba. Of the 13 films produced last year, top five films were selected for the final nominations in every category. There were 33 different categories this time.